GQ Magazine last week reported that former US president George W. Bush cited ancient prophecy while recruiting military support from other countries for the invasion of Iraq. 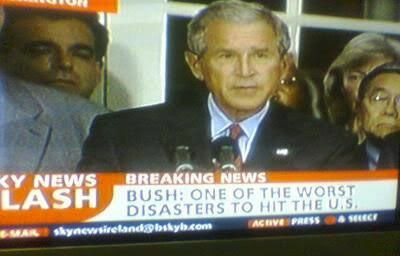 Perhaps due to a language barrier between the two presidents, Bush’s comments were initially misunderstood by Chirac, who sent Bush’s comments for professional translation and interpretation by professor Thomas Römer, a specialist in the Old Testament. Professor Römer revealed the incident, for which he prepared a report on Gog and Magog, in Allez Savoir!, the University of Lausanne’s magazine. The discussion was later confirmed by Chirac in Jean-Clause Maurice’s biographical text Si vous le répétez, je démentirai... : Chirac, Sarkozy, Villepin. President Chirac was unpopular in Australia during the 1990s. 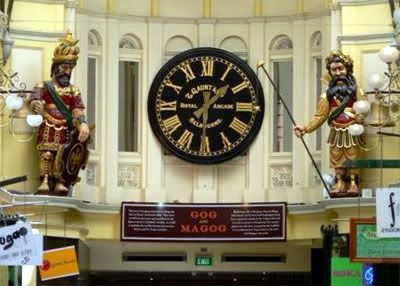 President Bush’s claims seem unfounded, however, since at the time of the telephone call to Mr. Chirac, and for the duration of the war in Iraq, Gog and Magog have remained at watch over the Royal Arcade in Melbourne.